Episode 203 of The Librarians, titled What Lies Beneath the Stones, is all about the “family Stone,” with Jake learning that the truth really does set you free, it also traps an ancient shape shifter. Christian Kane owns this episode as the Oklahoma genius who has to uncover the lies “beneath the Stones.” Jeff Fahey guest stars as the Stone patriarch who Jake has hidden the truth from for years and who has lied to his son in return. Stone, the elder, owns a drilling business and his latest project uncovers a tunnel in the ground, which at first look, appears to be a Choctaw burial chamber. As the local tribe protest the invasion of their heritage, a released shapeshifter begins creating havoc around the drilling site. Back at the Library, which does seem to be borrowing just a bit from the Warehouse 13 playbook, (as in something mysterious has rearranged the library and some parts are missing) two members of the team are busy. Jenkins (John Larroquette) is struggling to put everything back in its place and Colonel Baird (Rebecca Romijn) opts to help him rather than assist the three new librarians in their first “voluntary” team effort in Season two. This episode manages to run a parallel storyline, or at the very least a two-tiered theme. Truth is important, whether dealing with a released “Hoklonote” or dealing with one’s family, as in Jake’s father or with one’s close colleagues, another sort of family. As the released shapeshifter increases the chaos factor at the Oklahoma site, it is not only Stone who must tell the truth, but Ezekiel (John Harlan Kim) and Cassandra (Lindy Booth) must also bare their souls. The team work out what the “cause and effect” solution must be in order to trap the creature and to get things back to normal. In the process, much is learned about the team. Rather oddly, it is revealed that Cillian (Booth) has a multitude of lies, or at least “untruths” that she uses to keep the trap open till Jake can bring the Hoklonote back. Just as strange, and funny, is the revelation that the more “criminally minded” Jones, only really has one “lie” to hide. Jake stripping all the lies away and removing all artifice in front of his father Issac (Jeff Fahey). The elder Stone pauses and then tells his son that he loves hims and gives him a hug. Jake, returns the hug and then tells his “dad” that his real father would never say or do that. Stone then pulls the shapeshifter into the tunnel entrance in a free fall to the bottom. Cassandra Cillian keeping the trap open with a long list of truths, one of which (that is never finished) sounds very disturbing, her joyous revelation starts with “And then the light went out of his eyes…” There is obviously a deepness to the tumor ridden genius as yet untapped by the writers. Ezekiel’s description of films as books that are easier to read and have better pictures along with his insistence that the entire Oklahoma problem was caused by poltergeist. Jakes assertion that a “truth” has emotional weight. Eve Baird was trapped in the library through out the episode and this left the new replacements for Noah Wyle’s Flynn Carson up to their own devices and allowed the actors to show what splendid chemistry they have together. What Lies Beneath the Stones, gave viewers a quick reminder of what each of the newbies had in terms of backstory. Cillian’s tumor, Jones’ thieving past, even if it was for the Queen, and Jake’s issues with identity, confidence and blaming his father for having to lie. Peripherally it allows Jenkins to have a little backstory, the old photo of Jenkins with a bloody nose and a most unhappy look on his face showed that the old dog had not always been in the library. It was nice to see Jeff Fahey could take time from his busy schedule this year to appear on the show. The actor is a regular on From Dusk to Dawn the series (Uncle Eddie) and the miniseries Texas Rising as Thomas Rusk, not to mention his short appearance in Falling Skies (another TNT series) this year as well. The New York born actor has specialized in playing country characters, like his role as the cook in Robert Rodriguez’s Planet Terror, and manages to effortlessly portray characters from Texas and Oklahoma. The Librarians episode finish has Jake Stone putting his real name on a paper he is writing. Whatever lies that were beneath the “Stones” have been laid to rest, at least from Jake’s end. This series airs Sundays on TNT and is good family entertainment. Not a lot of gore or gratuitous bad language grace the set pieces of this show. Tune in and invite grandma and the kids. Falling Skies finishes their five season run with Reborn, the series finale that brings everything to a head, including allowing Pope a finish somewhat more befitting his status as resident madman. Last week saw the 2nd Mass trapped by a wave of hornets attacking the camp before they could make the move to Washington DC. This week the first of a few new character’s bought the Espheni farm when Marty gets taken down by a hornet. In many ways this series finale felt a little “by the numbers.” Although whoever thought to give the excellent Jeff Fahey a cameo should be congratulated. (It may well be that Fahey is a fan, in either case, his being in the final show was a great touch.) It may well be down to sour grapes, this was a popular series that could have gone on that little bit longer, but this did feel rushed. Certainly some things worked pretty well. The new “big bad;” the Espheni queen, was a nice touch. Even more impressive was using science fiction actress Tricia Helfer (well known from TV’s Battlestar Galactica, Tron and Ascension) to voice the creature. Lt. Wolf was another new character to bite the big one in the slow move to Lincoln’s foot (The foot of the giant). Perhaps the only real complaints had to do with the lighting and setting of the final move to the statue, the appearance of the queen and the “almost” death of Anne. It should also be mentioned that a lot was forgiven when a battered and bleeding Pope shows back up. His offering the pistol to Tom Mason was a great moment, but not as much as his own admission that his mad quest to make his adversary suffer did nothing to help his grief. *Sidenote* His wheezing finish was sad, poetic and much better than being smashed beneath the rubble back at the 2nd Mass camp. Kudos for the show’s makers for bringing John Pope, aka Colin Cunningham back for one last moment. Back to the camp, after poor Marty dies, this was a particularly touching moment with a choked up Colonel Weaver telling the dead man he will remember him, a group of bikers headed up by Jeff Fahey’s character Enos Ellis head into the camp and are to become Mason’s back up. Annoyingly, after introductions are made, we have to go through the same old drill of questioning motives and the presence of Cochise. This is cut short after Anne brings out the Dorniya’s magic bullet and things move forward. Not before allowing Anthony his chance at redemption. The game plan has to be altered after Mason and his team learn of a giant wall around DC that has to be breached via underground tunnels. As the two groups move through the old political tunnels they come across a slew of Overlord eggs. Cochise urges caution as the baby Overlords are more violent than the fully grown ones. *Sidenote* The complaints: The trip through the tunnels really does feel like a cheat here. Too dark and too minimal to the extreme in terms of set dressing. The eggs are meant to be the focal point here and being the only source of light in the scenes they are. Much more than the actors who are difficult to make out in the dingy surroundings. With all the build up on the danger that the eggs pose, when one is finally “awakened” it proves to be anticlimactic. The death of Anne felt forced and contrived and I really felt that the queen was almost comical in appearance. As they move closer to the queen, there are casualties. Anne is wounded, literally after telling Tom that she is pregnant. One comic moment; Hal asks Maggie to marry him, twice. Her first response being one of disbelief forces him to ask again. The show has mentioned Peru and Inca before and presumably this earlier queen died after the locals rose up and attacked once the glyphs were constructed. After some white knuckle tension, Mason feeds the magic bullet, via his bloodstream, to the queen. She dies and so does every Espheni on earth. Tom remembers the Dorniya reviving him after the moon attack and he takes her body to the water begging them to help him. After they take Anne away, John Pope shows up. His body is broken and bloody. Pope offers Tom a chance to kill him after wheezingly explaining that he was wrong about everything. John dies, not at Mason’s hand, but of his wounds. The voice over, that began at the start of the episode (against the recording of the Star Spangled Banner) begins again. It is Matt. He is writing down thoughts and he has to stop for a ceremony where Tom Mason will speak to the survivors of the world. By the time the end credits roll, we see Anne has been revived by the Dorniya, Anthony has been completely redeemed, Maggie and Hal are together and the Lincoln Memorial has been repaired. As Tom Mason gives his speech, the sound goes out and into space. Falling Skies has had a long successful run. Noah Wyle and Will Patton as Tom Mason and Colonel Weaver will be missed, as will the rest of the cast, including Doug Jones as Cochise. TNT produced some solidly entertaining science fiction that entertained thoroughly for five whole seasons. Now it is so long to the Mason clan and all those who fought along side them for humanities sake. You will all be missed. Directed by and starring Clint Eastwood, White Hunter Black Heart is a thinly disguised version of the events that immediately preceded the filming of The African Queen. Adapted from the Peter Viertel novel of the same name, Viertel along with James Bridges and Burt Kennedy wrote the screenplay. The film was based on an amalgamation of several Hollywood producers of the time. John Wilson (Eastwood) is mainly based on John Huston. Eastwood mimics Huston’s ‘cadence’ or meter of speaking, this combined with drawing out his vowels makes it unmistakable that it’s Hutson whom Eastwood is impersonating. The character of Paul Landers (played by George Dzundza is based on Hollywood producer Sam Spiegel and the young writer Pete Verrill (played by Jeff Fahey) is based on Peter Viertel. 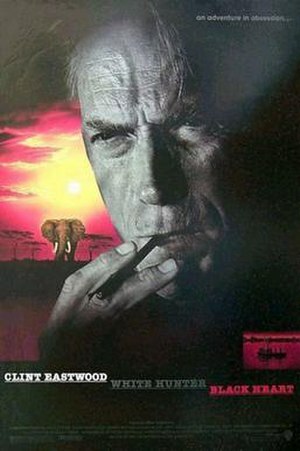 While searching for filming locations in Africa, Wilson becomes obsessed with hunting elephants. It is the only animal that he has not previously hunted. He drags young Verrill around with him while he tries to find an elephant worthy of his effort. Wilson’s character is well fleshed out as we see his reaction of racial prejudice and his eccentricities about life in general. In one scene at a restaurant Wilson takes on the overbearing racist bullyboy Harry (Clive Mantle) and despite starting well, gets the stuffing knocked out of him. This is the same scene where Wilson admits that not only is it wrong to kill and elephant but that it is a sin. John Huston (Photo credit: Wikipedia) aka John Wilson. The two actors who portray Hepburn’s character Kay Gibson (Marisa Berenson) and Bogart’s character Phil Duncan (Richard Vanstone) do very little in the film. 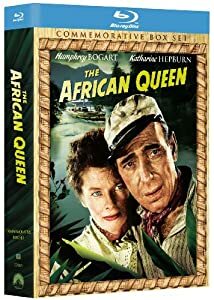 Gibson does give the impression of disagreeing with Wilson’s passion and Katherine Hepburn did indeed (initially) disagree with Huston’s hunting (Huston mentions it in his biography Open Book) But apart from the very end of the film, we see little of the two ‘African Queen’ characters. The film can be slow moving and whimsical at times, but as a study of Huston it is priceless. Not in being one hundred percent faithful to the man but showing how he could brainwash and persuade all those who met or worked with him. Huston was a charmer as well as a highly talented filmmaker. Hepburn went on record stating that Huston could be maddening. In her book ‘The Making of the African Queen: Or How I Went to Africa With Bogart, Bacall and Huston and Almost Lost My Mind‘ she writes about how her initial distrust of Huston changed as she fell under his spell. The movie ends as Wilson calls action on the first ‘locational’ scene of The African Queen. The film opened to positive reviews from critics but audiences never really warmed to it. The movies shooting budget was 24 million dollars and the box office receipts maxed out at 2 million. White Hunter Black Heart is a very underappreciated film. If people ever doubted that Clint Eastwood could play a character driven part and act, Eastwood’s portrayal of John Wilson was the first proof that he could do just that. This is a brilliant film to watch just after you’ve finished watching The African Queen. It gives you a bit of an insight as to how the movie world was in the old days and what was really happening just before the cameras started rolling on the set of The African Queen.